Jaangri in South India, or Imarti, as it is called in North India, is a famous delicacy which is prepared around Diwali. 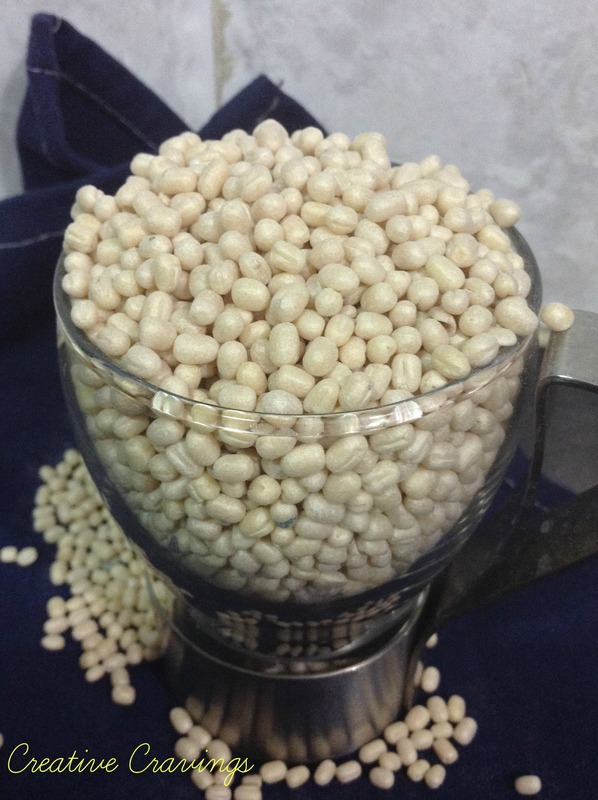 It is made by soaking dehusked black gram (thus making it high in protein). Soak gram for about 2 hours. Grind it using a little water to make a smooth, fluffy dough. Add colour and a pinch of salt, and keep aside. Combine sugar and water, and boil till you get a one-thread consistency. This means that you will have to keep checking the syrup’s stickiness. Check the back of the ladle used to stir the sugar syrup with your fingers now and then. Basically ‘pinch’ the syrup at the back of the ladle between your thumb and index finger, and pull these two fingers apart. You will know that you have the one-thread consistency when the syrup starts to form a thin thread between your fingers. This is the traditional method followed for generations to check the consistency of syrup (an important ingredient to make sure our yummy delicacies are perfect in taste and texture). Once you get the correct thread consistency, turn off the stove and add half a teaspoon of lemon juice to the syrup (to avoid crystallization). Add a pinch of colour and essence. Take a ziplock/milk pouch, make a small hole the size of a peppercorn with the help of a needle. Fill up to half the pouch with batter, and your jaangris are ready to be fried. Heat oil in a wok/ broad pan. When small bubbles start to form, squeeze a ring shape into the oil from the batter-filled pouch. Don’t mind the shapes if they don’t turn out well. 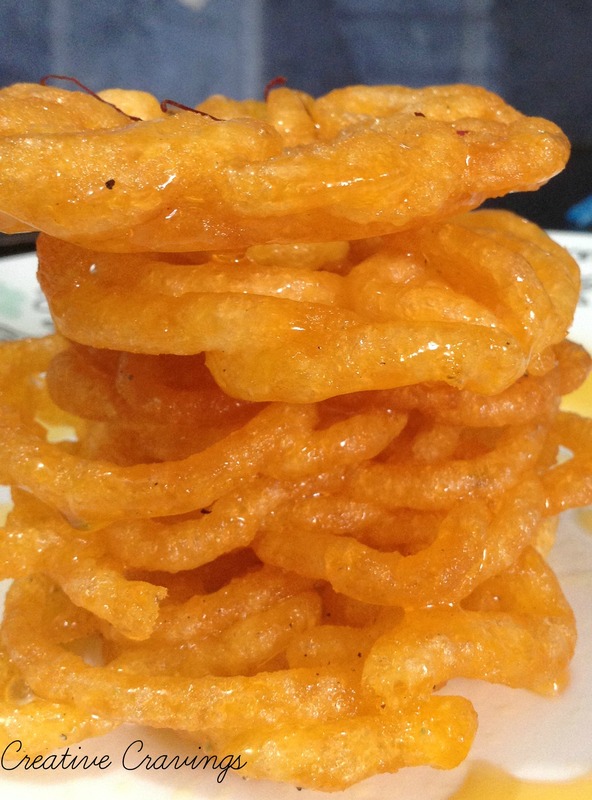 Even a random set of rings would be as yum as the elaborate, well-formed ones. 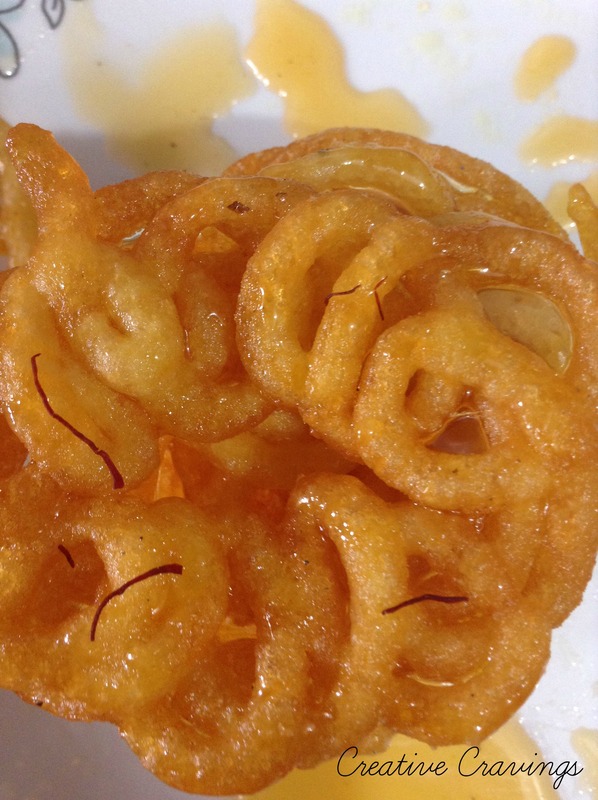 Keep the flame medium-low while frying and remove the jaangris once they are slightly crisp on both sides. Note that they will not change in colour. Once removed from oil, dunk them into already prepared warm syrup for 2-3 minutes and set on a greased plate. Repeat for the rest of the batter. The jaangris mostly take 2-3 hours to soak in the sugar juices before they are ready to be attacked. – Size of the hole: If it is too big, your jaangris won’t absorb enough sugar to make them sweet. If it is too small, the texture is spoilt and the jaangri will be too brittle. So remember to make a hole just the size of a peppercorn. – Temperature of the oil: The oil should just start to bubble before you squeeze in the jaangri. Try to maintain this medium heat throughout the frying process. Too much heat will make the jaangri drastically puff up in size (like a vada!). Needless to say, this will spoil the texture of the beautiful jaangri. – Temperature of the syrup: Once fried, the jaangris must be directly transferred from the oil to the warm syrup. Basically, both the jaangri and the sugar syrup have to be warm. If the syrup cools down, make sure to just warm it for a couple of minutes on a low flame before dunking the jaangris into it. Black gram/urad dal as it is called in India has many health benefits. It is rich in iron, protein, calcium, potassium, B vitamins and fibre. It is also easier on the tummy than most other legumes, making it the most popular ingredient in South Indian breakfast recipes. Yes! Idli, dosa, vadai, oothappam all have urad dal as the main ingredient! How to Buy Make sure the bean is free from debris, stone and dust. If you notice a powdery substance inside the packet, the bean might be bug infested. Of course, check for the expiry date. Storage Always store in an airtight container in a cool and dry place. Refrigerate or rather freeze the legume to increase the shelf life drastically. Usage Soak overnight, if you want it to be mushy in your dishes (as in dal). If you are grinding for batter, it is best to soak only for 2 hours. Grind using a little ice cold water to get soft, fluffy dough, which is best for most Indian dishes.